A charming and unusual set of four (now framed as one) small hand finely painted thick tiles depicting scenes and verses from Kate Greenway’s nursery tale, Mother Goose; newly framed. 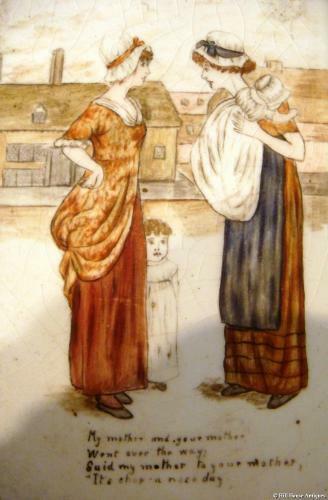 The tiles by Robert Brown & Sons, Paisley; each one is approx 4” by 3.25”. The Brown works was active between the 1850’s and 1930’s; originally brick makers but their repertoire also extended to tiles and garden statuary. They also supplied the famous Gleneagles Hotel in Scotland with all the marble and tile work in the early 20thC. h: 10.5” w: 7” inc frame.